No needles. No pills. No risk of dependency. Though you may never have heard of it, neurofeedback has been been utilized for many years to reduce anxiety, improve sleep, combat migraines and addictions, increase focus and attention, and and treat many other common problems without drugs or any significant lasting side effects. With the technology available today, we are able to train the brain for optimal mental and physical functioning. It has great potential for impacting some of the most debilitating conditions human beings can suffer. It has the capability of quickly shifting a person into a calm, focused state, which when revisited over a number of sessions permanently changes the brain in ways that improve overall functioning. A prime example of neurofeedback’s quick effectiveness is migraine treatment. A person can arrive with a migraine to our clinic and leave in 45 minutes with a significantly reduced headache and potentially be free from pain and other symptoms by morning. 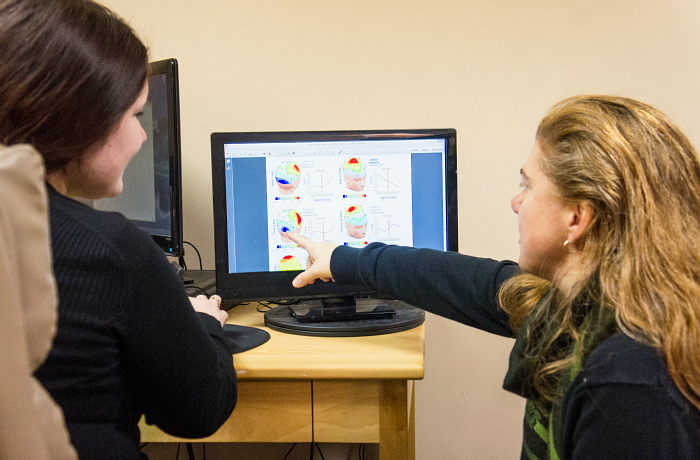 The primary goal of neurofeedback is to treat mental and physical problems by optimizing brain functioning. Just as you can train your body to function with greater strength, efficiency and flexibility, we can train your brain to operate in a more efficient and flexible way. 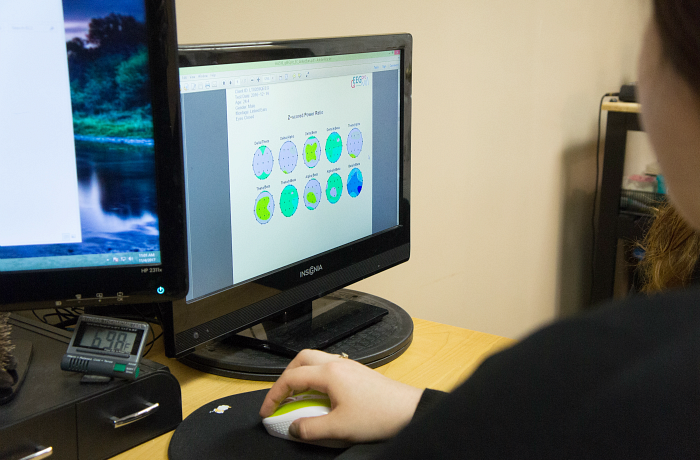 Our neurofeedback clients usually feel relief in the first session, and experience overall improvement in just a handful of sessions, depending on the type and severity of the condition we are treating. 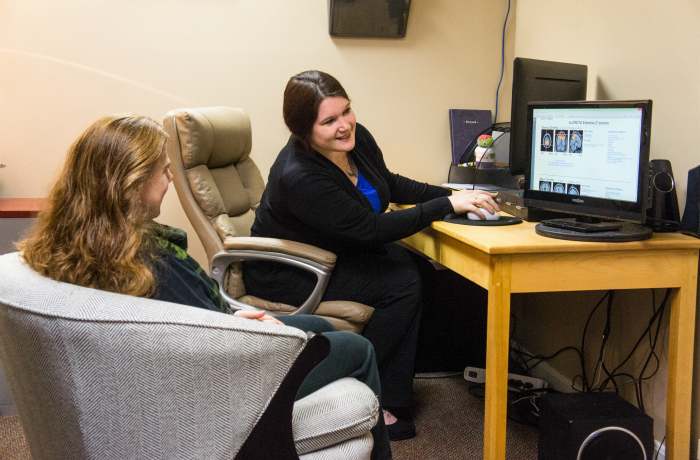 For more information about how neurofeedback can help you, or to set up our appointment, please contact us, or see our FAQ page. Neurofeedback training is a form of brainwave biofeedback. Training involves the placement of electrodes on the scalp in order to feed signals to an EEG amplifier. The EEG equipment provides real-time, instantaneous audio and visual feedback to the subject about his or her brainwave activity. No electrical current is put into the brain. The brain’s electrical activity is simply relayed to computer software. When an individual can see a representation of his or her brainwave activity on a computer screen in real-time, it is possible for that subject to influence and change that activity in ways that lead to a more efficient calm brain. Through this process, we are now about to literally retrain the brain. While useful in addressing clinical problems, increasingly sophisticated research has begun to delineate brainwave patterns that are associated with various types of peak performance. In general, training the brain to more efficiently produce such patterns leads to measurable improvements in focus, concentration and attention, lowered anxiety levels, and less disruptive mental chatter. Neurfeedback trains the brain to function more efficiently, improving mental agility and dexterity in ways that positively impact physical performance. Focus and emotional balance is at the heart of peak performance. There is documented improvement using neurofeedback by elite athletes, surgeons, corporate executives, musicians, professional poker champions and more. Yogis use it as a mental guide to reach meditative and other spiritual states. Many utilize it to get relief generally from stress, to improve sleep, and simply to be the best performers no matter what circumstances they face. Neurofeedback is used for peak performance training by: The Pro golf circuit, Formula 1 race teams, United States Olympic Training Center, English Institute of Sports (Olympic Training Center), Canadian National Olympic Sports Center, US Special Forces and Navy Seals training, United States Army Centers for Enhanced Performance, Human Potential Institute (Australian Special Forces), and West Point Military Academy. People most benefiting from peak performance neurofeedback training are those who intensively use their minds and bodies to take on challenges. Also, people who are exposed to considerable levels of daily stress, for example, performing musicians, athletes, authors or academic professionals, business people, firemen and other first responders, managers, pilots, law enforcement professionals, and students. Research suggests that about 90% of users notice significant positive impact from the training. The level of impact varies individually from subtle to strong. Subjective estimations of improved attention and performance have been confirmed with examination of such objective indicators as rates of errors, improved visual-auditory efficiency, improved school performance, measured increases in IQ, and measured improvement in attention, focus, concentration, and mental efficiency, as well as measurable improvement in sports related performance.